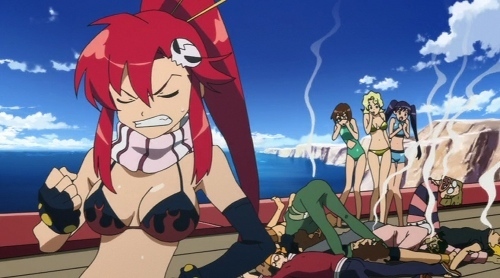 As far as blatant beach episodes go, Gurren Lagann’s was surprisingly tame, and had a plot! Plot: Hey, I just said it had one. 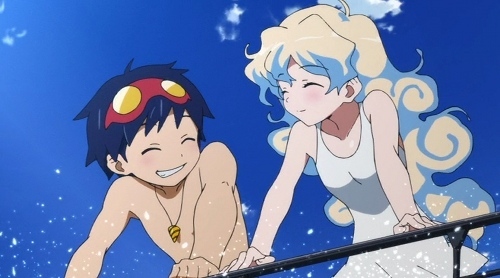 Dai-Gurren and her (his?) fine crew have reached the coast, with no option other than to traverse it. Of course, once in the water this allows whatshername and whosits (what I call Adiane and Viral now) to launch an attack in their home territory. Well, Adiane’s territory specifically. No wait, whatshername. Hilarity: What Gainax lacked in their restrained RBE (below), they more than made up for with abject absurdity! Dai-Gurren’s retrofitting, complete with a gigantic paddle and the giant feet converted to flippers had me giggling a little too loudly to be considered healthy! The Required Beach Episode™: In short(s), the Required Beach Episode is nearly always included purely so the animators can dress their characters in various states of undress. 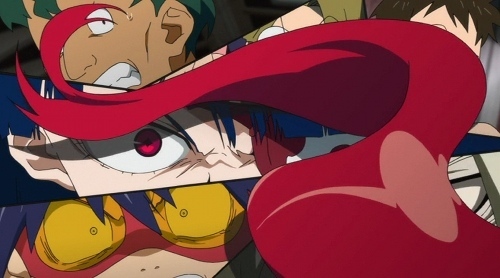 Surprisingly, Gainax’s Gurren Lagann beach episode was surprisingly tame. Not a single top "accidently" came off! Relativity: Upon seeing the swimsuits of the Black Siblings, Yoko exclaimed their attire was "ridiculous". This coming from a fighter who wears a bikini top and hot pants all the time. I suppose for her they’re just clothes, in which case it’s relativity? I have no idea. 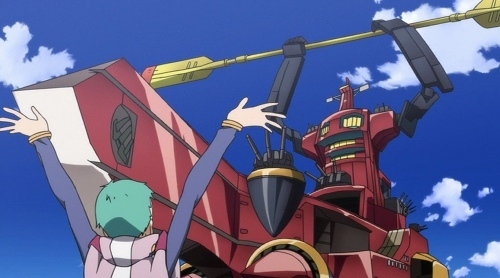 Explanations: So the reason they have to frolic in the water is entirely due to the fact Dai-Gurren’s appearance of seaworthiness is merely a façade, and that a retrofitting will take time. I’ve seen far more tenuous reasons ;). 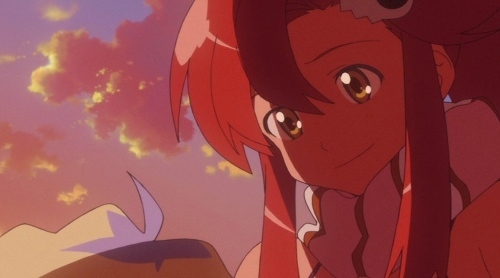 Art: Gainax’s strong suit seems to be their skies and landscapes. The water in this episode looked fairly flat. Oh well. Tactics: Having tried blowing them up, crushing them, shooting at them and tricking them, the enemies this time attempt to push Dai-Gurren’s pressure limits underwater with some pretty evil looking hook things, from the comfort of their rather swish bridge. Clearly taking back the Gunmen isn’t the priority any more! Production: I’m not a media student, but splitting the screen up into frames to focus on all the chacracters faces, then having Yoko’s hair drift over it before she whooped arse was just brilliant! 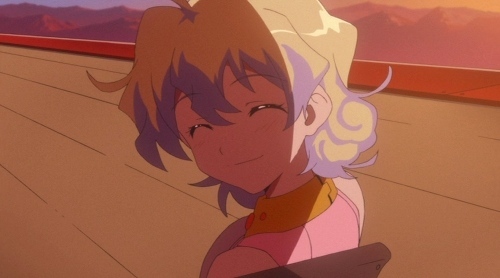 Cliche: After being outcast for much of the episode, we all knew Yoko would be instrumental in saving the day and winning everyone back, but it was still awesome to see her do so. Of course, Nia also has the unshakable belief Simon will save them; and the room in which she confesses it to Yoko proves to be another one of the more hilariously framed scenes! Character development: After seeing Yoko portrayed as a more stubborn and cold person of late, we finally see her more caring side, while obviously still being a fiercely independent and strong person. The final scene at dusk where she and Nia bond while she cuts her hair was really sweet. I hope to see more of this :). Conclusion: An episode I feared would be shallow turned out to be a great watch, with some real progress in the story and the characters. I approved! Newer post ← Were we all Punk’d by HP?